Myrna Loy rose through the ranks of "exotic" actresses to become a very popular leading lady after her success in The Thin Man with William Powell, with whom she made 14 films. Highly likeable, Loy embodied an image of a type of woman men adored and women aspired to be like. A true great. Born to a rancher turned Montana State legislator father and a mother who was a trained musician, Myrna was of Welsh, Scottish and Swedish ancestry. The family had visited Los Angeles in the late 1910s, but returned to Montana, where Myrna took dancing lessons. With the death of her father in 1918, Myrna's mother moved the family to Culver City, where she attended Venice High School. She posed for the sculpture Fountain of Education, a replica of which stands before the school today. To help the family finances, Myrna left school at the age of 18, and found work in the dancing ensemble at Sid Grauman's Egyptian Theatre. A chance sighting of her photo by Rudolph Valentino led to extra work, beginning with a small role in What Price Beauty? (released in January, 1925). This led to a contract at Warner Bros., where her last name was changed to Loy. It was here where Loy was cast as the evil Asian "exotic" tempress in several films. She was loaned out to Fox for director John Ford's The Black Watch (released in May, 1929), where she got second billing with Victor McLaglen, and played Boris Karloff's daughter in The Mask of Fu Manchu (released in November, 1932) at M-G-M.
Loy got her big break by appearing in Manhattan Melodrama (released in May, 1934) with Clark Gable and William Powell. In order to test the actress, director W.S. Van Dyke pushed Loy into a swimming pool at a Hollywood party; Loy handled it with aplomb, and was cast as Nora Charles inThe Thin Man with William Powell. Released in May, 1934, the film became an enourmous hit, and Loy's career was assured. When she and Powell were asked to make their imprints at the Chinese, for a laugh, they both showed up in huge clown shoes telling Grauman they wanted to make a "big impression." Loy sensed that Grauman was hurt by this ribbing of his Forecourt bestowement, so she inscribed "To Sid who gave me my first job" hoping it would placate him. It seemed to. Now, Loy was a star, and they paired her with all the big male stars. The Great Ziegfeld with Powell again (which played the Chinese in November, 1936), After the Thin Man with Powell (played the Chinese in December, 1936), Test Pilot with Clark Gable (played in April, 1938), and The Rains Came with Tyrone Power (played in September, 1939). Loy abandoned the screen during World War II, working with the Red Cross while running a Naval Auxiliary canteen in between Bond selling tours. She co-starred in The Best Years of Our Lives (released in November, 1946), which not only became the biggest hit film of that year, but it is also her role as Milly Stephenson which remains her signature performance. Other films she appeared in include: The Bachelor and the Bobby-Soxer (released in September, 1947), Mr. Blandings Builds His Dream House (which played the Chinese in September, 1948), and Cheaper by the Dozen (played the Chinese in April, 1950). By now, Loy had become the first Hollywood figure to serve on the UNESCO Commission, and she was also involved with anti-descrimination efforts in housing. Her screen appearances began to slow to a trickle: Belles on Their Toes (played the Chinese in May, 1952), From the Terrace (released in July, 1960), and Midnight Lace (released in October, 1960), and The April Fools (1969) She also did a fair amount of television work. Loy was honored with a screening of Libeled Lady (which played the Chinese on its original release in October, 1936), followed by a personal appearance / question and answer tribute at the second Filmex at the Chinese in November, 1972. Loy continued to act in films, Airport 1975 (released in October, 1975), The End (released in May, 1978), and her last film, Just Tell Me What You Want (released in January, 1980). 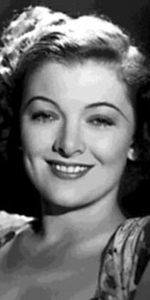 During this time, Loy suffered from breast cancer. She published her autobiography as Myrna Loy: Being and Becoming in 1987. In declining health, she accepted an Honorary Oscar via video link in 1991, and passed away during surgery in 1993. She was 88 years old. Grauman's Chinese Theatre, Hollywood, California. William Powell / Myrna Loy Forecourt ceremony, Wednesday, October 20, 1936. 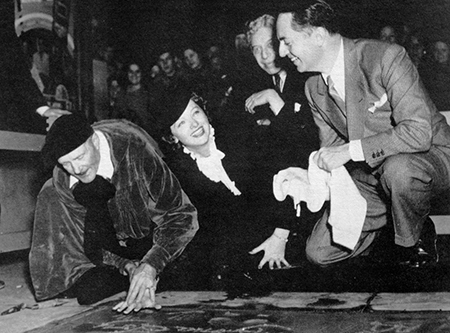 Cement artist Jean Klossner impresses Myrna Loy's hand into the cement, while Sid Grauman and William Powell look on.